When an airplane goes down to a watery grave, it slowly transforms into something other-worldly and astonishingly beautiful. Just like sunken ships, underwater plane wrecks become a playground for creatures of the deep and slowly corrode into something fantastic-looking. See for yourself! Top image: crashed WW2 Corsair plane by Sphinx Wang/Shutterstock. Lady of the Lake, a partially submerged WB-29, which is a variant of the iconic B-29 Superfortress, used for weather monitoring missions and to test radiation levels after nuclear weapon tests. It rests in a water-filled gravel pit on Eielson Air Force Base, 26 miles southeast of Fairbanks, Alaska. A B-17F named "Black Jack", ditched close to the beach near Boga-Boga, Papua New Guinea after the crew was unable to reach Port Moresby after a succesful bombing mission. The bomber had two malfunctioning engines and running low on fuel. Sunk on June 10, 1943, rediscovered in 1986. A Vought F4U Corsair fighter plane at Maunalua Bay, Hawaii. 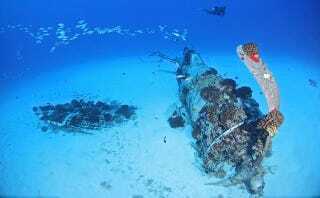 Sank in 1946 during a training exercise when it ran out of fuel. "Maid of Harlech", the oldest surviving P-38 Lightning (and the only intact P-38F), crash landed in Wales, 1942, resurfaced in 2007. The F-4 Phantom of Subic Bay, Philippines. It was damaged beyond repair during Vietnam War and pushed off a US aircraft carrier. A Shorts 330-200 off Great Dog Island, Tasmania. The plane ran off the end of the runway into a bay in 1993. Later it was raised, but sunk again without wings as a part of an artificial reef.